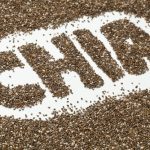 It’s difficult to overstate the value of the miraculous superfood that is the chia seed, especially for its potential to bolster and round out a vegetarian diet. The tiny seeds are so nutritious that a single tablespoon is believed to sustain a person for 24 hours of strenuous activity. Chia seeds are, cheap, easy to grow, can be added to any food, and are increasingly available in health food stores and through a multitude of online retailers. The 1-millimeter diameter, black, brown, and white Chia seed comes from Salvia hispanica, a plant native to American and Mexican deserts. This is the same plant that supplies the hair for a Chia Pet, but the plant has long been cultivated by native tribes of Mexico, including the Aztec and the Tarahumara (as described in the Christopher McDougall book, Born to Run). The Spanish conquistadors outlawed the cultivation of Salvia hispanica due to its importance in native culture, but the seeds are now experiencing a resurgence in popularity in North America. Chia seeds contain a high amount of a number of important nutrients. Not only are they high in protein, phosphorus, manganese, potassium, sodium and calcium, they contain three times more iron than spinach. One tablespoon of chia seeds contains over 2200mg of Omega-3 fatty acids and over 700mg of Omega-6 fatty acids. Chia seeds are also high in antioxidants, which is what makes them capable of being stored for long periods of time without going rancid, unlike flax seeds. Speaking of flax, Chia seed has many other benefits over flax seed. Flax is a whole grain commonly used to supplement a healthy diet, particularly a vegetarian diet. Chia seeds are higher in almost every notable vitamin and nutrient and can be eaten whole, whereas the tough outer shell of the flax seed will cause it to pass through the body without being digested. Chia seeds are high in dietary fiber, but are also beneficial to the digestive system because they are mucilaginous, meaning that when they are soaked in water, they turn to a gel-like consistency and will suspend themselves in liquid. This also happens in your stomach when you eat chia seeds, which slows down digestion, allowing more carbohydrates to be broken down and converted to sugar. This mucilaginous process is also what creates Chia fresca, or Iskiate, a natural energy drink traditionally consumed by some native tribes in North America. The Tarahumara ultramarathon-running tribe of the Copper Canyons of Mexico use this drink to sustain themselves on extremely long runs over wild and unforgiving terrain. Chia fresca is simply chia seeds steeped in water and lemon or lime juice with honey or agave nectar added as desired. Chia fresca is a great energy boost, particularly with breakfast. Due to their very mild, nutty flavor, chia seeds can be drank in water, tea, or juice, eaten plain, raw, ground, or cooked and added to just about any food. Whole chia seeds are great sprinkled on cereal or salad or added to trail mix. They can be ground and added to any recipe containing flour such as breads or muffins or sprinkled on top of baked goods along with cinnamon or nutmeg. They are a great nutrition booster for smoothies, can be cooked into lentil soup or stir fry or added to cooked rice or oatmeal. The result of the many nutrients contained in chia seeds and the way they are digested by the body is a healthier digestive system and blood sugar level. Also, they are a great source of energy and boost endurance. They’re nutritious, filling, and provide a large amount of energy, controlling appetite and helping the body get more nutrition from other foods. For vegetarians, the added protein and iron are particularly beneficial, but their versatility and high nutritional content make a valuable addition to any diet.